Natural Health News — Eating almonds on a regular basis may help boost levels of HDL cholesterol while simultaneously improving the way it removes cholesterol from the body. In fact a study in 2016 suggested that while eating almonds resulted in significant reductions in total cholesterol, “bad” LDL cholesterol and triglycerides, it seemed to have no significant impact on “good” HDL cholesterol levels. » Almonds are a good source of protein and healthy fats, and they have been shown previously to reduce levels of harmful LDL cholesterol. 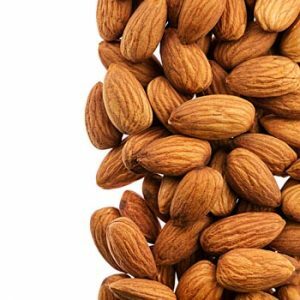 » In a new study, US researchers have shown that a daily almond snack also helps raise levels of beneficial HDL cholesterol. » In addition, it was demonstrated that the almond snack made a particular type of HDL, known as alpha 1, more active in helping to remove cholesterol from the bloodstream. For the current study, published in the Journal of Nutrition, 48 men and women with elevated LDL (‘bad’) cholesterol participated in two six-week diet periods. In both, their diets were identical except for the daily snack. On the almond diet, participants received 43 grams – about a handful – of almonds a day. During the control period, they received a banana muffin instead. At the end of each diet period, the US researchers measured the levels and function of each participant’s HDL (‘good’) cholesterol (e.g. it’s ability to remove cholesterol from tissues, like the arteries, and helping to transport it out of the body) and compared these to measurements taken at the beginning of the study. Compared to the control diet, the almond diet increased what is known as “alpha-1” HDL – when the particles are at their largest size and most mature stage – by 19%. Depending on how much cholesterol it has collected, HDL cholesterol is categorized into five “subpopulations,” which range from the very small to the larger, more mature alpha-1. The researchers found that the almond diet improved HDL function by 6.4%, in participants of normal weight. An increase in this particular HDL sub-population is meaningful, Kris-Etherton explained, because the particles have been shown to decrease overall risk of cardiovascular disease. Kris-Etherton said that while almonds will not eliminate the risk of heart disease, they may be a smart choice for a healthy snack. She added that in addition to their heart-healthy benefits, almonds also provide a dose of good fats, vitamin E and fibre. Previous studies have shown that women who snack on 42g (1.5 oz) of almonds in the morning are less likely to overeat at later meals. A 2015 University of Toronto study also found that participants who ate almonds saw an improvement in factors associated with heart disease risk.